Minimalistic Cell Phone Stand / Phone Dock for iPhone / Smartphones for Charging / Live or Chats : allputer.com - Accessories for all your Portable Electronics & Computers! There is a way to keep your phone always standing out from any cultter and yet elegant. Here you are. - Always low profile: no matter at home or office, even in kitchen, nightstand, dining table, there is a role for it. 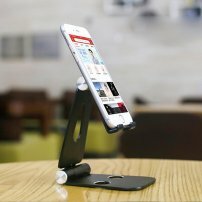 - Great Design: Designed on a low center of gravity makes it stable, and rubber cushions of hooks, bottom protect the phone from scratches and sliding. - Compact: When folded, you even cannot find there is a stand in your packet. - Great Uses: Perfect angle of view when using Facetime, chat, live and YouTube, easy to read message, facebook, emails, cooks from a recipe online.